Okay seriously people, I can barely stand how delicious this is. It’s going to knock your socks off, roll them into a little ball, and return them to your sock drawer. But it won’t blow your budget or your time, because you can make this in 15 minutes or less. I love easy, quick, and delicious recipes that free up time for other things. Having quick recipes you can get on the table in a snap is so helpful to anyone trying to juggle too many balls in the air. Which is pretty much everyone on earth nowadays. We are all so busy. Anyways, I have already confessed (here and here) how completely obsessed with chipotle peppers in adobo sauce I am. Truth is, I cannot get enough of them. I keep my pantry stocked with tiny little cans of chipotle peppers. They are perfect for so many recipes, so versatile, and absolutely delicious. A small amount gives a kick to any dish. 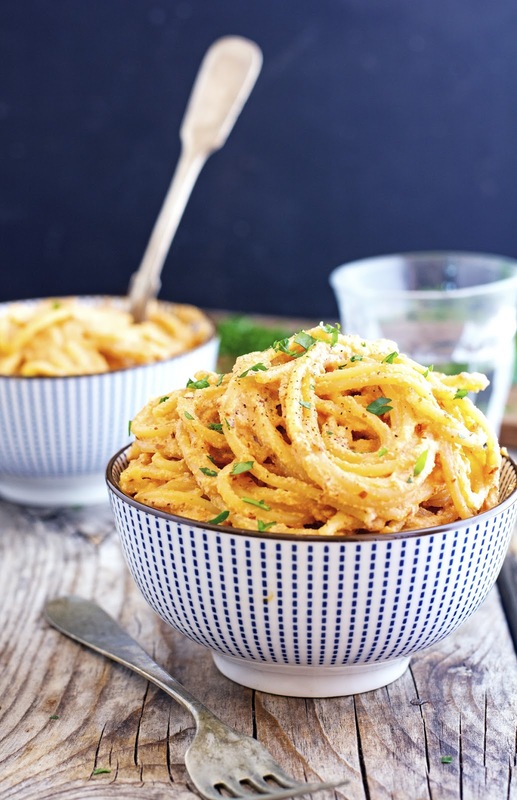 Such as in this super easy (Vegan) Creamy Chipotle Spaghetti, for instance. 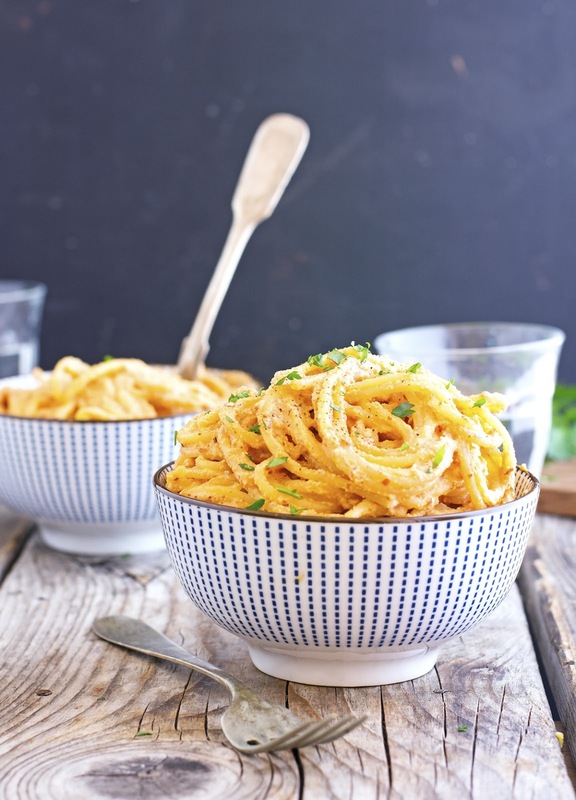 A couple of simple ingredients that you may already have at home and in a matter of minutes you can whip up the sauce in a blender. The smokiness of the chipotle paired with the acidity of the lemon juice make for an irresistible combination. dig it. Creamy, spicy, smoky, with a hint of earthiness. What’s there not love? Now go make some, you can thank me later! 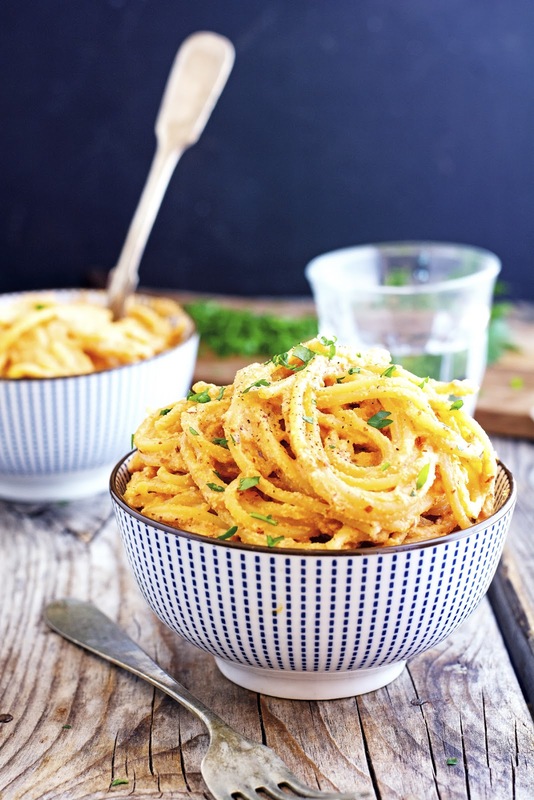 (Vegan) Creamy Chipotle Spaghetti Print this recipe! Bring a large pot of salted water to a boil and cook spaghetti al dente according to package directions. If the sauce is too dense, thin it by adding more water, one tablespoon at a time. Transfer sauce to a large skillet (or sauté pan) and heat over low heat. Drain the spaghetti and transfer to the pan. Stir well, until the spaghetti is evenly coated with the sauce. Sprinkle with fresh chopped parsley (or cilantro) and serve immediately. *If you don’t own a high powered blender, the sauce may be slightly grainy. To get a creamier sauce, soak the almonds overnight. *The nutrition facts are calculated using Garofalo gluten-free spaghetti. I'll be taking your word for it's deliciousness! Definitely looks and sounds good! Mmmmmmm I can't do almonds but I might try this with cashews! The Internet marketing industry is booming. More and more people are trying to get in on this exciting opportunity and make money for themselves. The problem is that the related scams are also growing. So if you want to know how to pin point out the scams from the real marketing opportunities. This looks perfect for meal prep! How many days do you think it would keep for in the fridge? You know it's way more calorific so stop lying please. Or maybe you rather lie to yourself ahaha ?